Another new online game to make more money in 2015. Just browsing the internet looking for new games to make money i found this one, it is fairly new and if my facts are correct it is made and ran by a company that have several other games out there. I have only just started to play this game myself online, so not a lot of information available just yet but i will keep you informed as i progress. Come join the fun and make money online, leave your thoughts on the blog and we can share ideas! Here is a guide for creating a newspaper with the news system that has been implemented at Marketglory, noticed there was a few people struggling so threw this together. 1. Make sure to pick your category. 2. Articles title must be at least 20 characters long but no more than 50. 3. Articles summary must be at least 150 characters. 4. Articles body must be at least 800 characters. Make sure to tick the declaration box and hit save article if no problems you will see the next page. If you do not see the next page to insert pictures then click edit at the bottom right corner of newspaper layout. 1. Click browse and find a picture you wish to insert, the picture or graphic must be at least 580px/290px. picture box, again you have to do this to go any further. 4. This is what you should end up with all boxes filled and cropped to what you want with a notice below each picture saying saved! You should then have the option to publish the article in the bottom right hand corner of the page, remember you can only publish one article per day. I came across this game a few weeks a go and have since been playing it everyday. 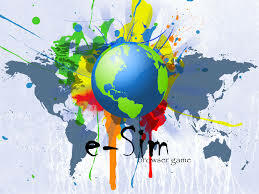 Again it is a game in which you can convert in game currency to real money and they have several active servers. It is free to join and you do not need to invest, you actually receive money to a partnership account just for being active. We all love a bit of free money. E-sim is a military, political, company based game it does look a bit scary at first but admittedly the developers having done a brilliant job of introducing you to everything in the game, this is done through 64 missions that you receive throughout the course of your first few days. It is the best kind of structure i have seen for starting a game especially ones like this where there is a lot to try and take in and work out. The missions take you through and teaches you about every aspect in the game. The game is ruled by players! Countries, parties, economy, newspapers, governments ... everything. You can become President or a congressman and lead the country! Achieve your own goals by referring friends and other people. Collect achievements and medals, loot equipment! Share experience with others and find your own way through the game. Create your own stock company, gather investors and trade shares. Remember to work and train everyday, complete the missions that are given to you everyday to help you get around. New season about to start on Goaltycoon, have you got what it takes to manage and run your own football team? Chose your own formation and training tactics earn more popularity to earn even more money. Upgrade you club elements as you earn money, buy youths and train them the way you want too then sell them to make more money. Free to join and no investment required, come and give it a go it costs nothing! Sign up here i am always available to help out.. Many of you probably know there is a wealth of information about Marketglory already on the internet, some of it however is outdated (not been kept up to date). I will be just going over some very basic stuff for the time being, the deeper stuff will come later on. The game is free to join and you do not have to invest to start making money, i am available for any questions, these are just the basics to get you up and running. I say this because for one i have looked myself and there have been a few changes with the layout and design of Marketglory, basically just making it a bit nicer to look at and get around a bit easier. There are the basics which people tell you about and there are mixed views as to the way you should do them. For example the general rule of thumb nowadays is to fight 10 times a day before you work rather than the other way around. The key aspect to making money in Marketglory is having a lot of experience which in turn affects your productivity level when working, obviously the higher your productivity the more you can make for a company therefore the more money you make as a wage on a daily basis. The best way i have found to increase you experience quickly is to buy referrals because when they are active everyday you get a bonus in gold and you have the chance to earn extra experience points when your referrals are active. It would be nice to just get referrals via your own link as they automatically get blocked for 100 days which means whatever they earn you receive some of that money too, otherwise you have to pay to block your referrals every 30 days which costs 0.8 euro's. This still applies to people that have signed up through your own link, however you don't pay anything for the first 100 days. Basically the more referrals you have the higher your earnings will be as you will not only be collecting your own currency but collecting the currencies of your referrals as well, which when you don't think about it too much can add up quite quickly and easily turned in to gold and then in to Euro's. - for 5 or more active referrals - by 3 points per day. So your aim would be to get 5 good referrals that are active everyday to increase your experience by 3 points per day. Remember as they earn you will be earning from them as well. As well as having active referrals another good way to earn extra is to make sure you work everyday because you receive a bonus for working 3 days in a row, i would say roughly 2.5 times your normal wage, it is important to clarify however these must be 3 days in a row not 3 days a week if you work for 2 days then miss the 3rd day it will reset so you will have to start from day 1 again. To work everyday you must have enough energy to cover your productivity, this works out to 10% of your productivity, the system will alert you if you do not have enough energy to work. As you can see from the sample below i do not have enough energy to be able to work i will need to raise my energy level to at least 24 which is roughly 10% of my productivity. To increase your energy you will need to buy products from the market and or newspapers which can be found on the main home page of your account. Obviously as your experience becomes higher so does your productivity so therefore your energy needs will become greater also. I will go in to more detail about other things at another time. All you need to worry about for now is opening an account fighting the trainer 10 times then work, you will make a little bit of money from the fights you have in case you need a little energy top up before you work for the day, which at this point and for a while you will only be purchasing newspapers. Remember fight and work consistently and get some referrals as soon as possible. Sign up here if any help or advice is required send me a pm in game to Adiuk or comment on here. The Stadium as we all no is the place where the magic happens and where home games are played by your team. The maximum capacity of the Stadium allowed at the moment is 100,000 seats, you do however only start with a capacity of 1000 seats. The number of paying supporters at your team’s home games is a very important factor and contributes massively to your Club’s finances. Therefore adding more seating and upgrading your stadium as quickly as possible is paramount to earning as much as you can, remember as in real life most clubs rely heavily on there ticket sales. You will need to get saving to start purchasing new seating, here are some rough guidelines of the prices you can expect to pay. Each unit you buy will give you 100 seats. Please remember you do not have to invest you can earn the money you need to upgrade and buy things with the in game currency. As discussed previously the number of tickets bought by supporters of both teams is determined by the popularity of your club and the popularity of your opposing club. See previous post (Popularity) regarding the breakdown of how many seats and type will be sold. Therefore you need to make sure that you have the seats available for each criteria otherwise you will lose popularity points. As mentioned previously you can affect the amount of supporters wishing to attend the game by increasing the ticket price, however i would not advice this as putting the prices too high can also cost you a lot of popularity points. I feel that popularity points are one of the most important things in the game as it directly affects your income. Remember ticket sales and attendance only apply to home games. If you are playing an away game then you don't need to worry about the attendance and ticket prices.